When William Gedney died in 1989 at the age of 56 he was little known except to a few colleagues and curators. This book, co-edited by Geoff Dyer, reveals Gedney’s remarkable photographs as well as writings by him. 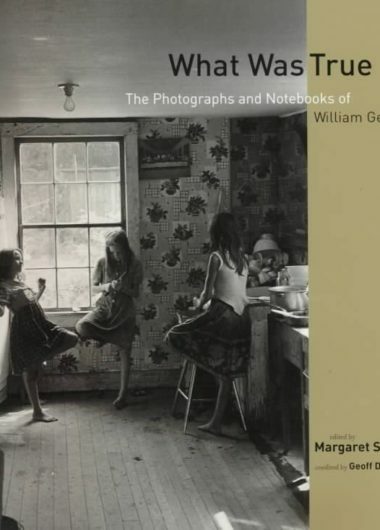 This is the first book of photographs and writings by William Gedney, an enigmatic photographer who died in 1989 at the age of fifty-six. He left behind a lifetime of photographic work, most of it unknown outside of a few colleagues and curators, including John Szarkowski, Lee Friedlander, and Diane Arbus. These photographs–taken primarily in New York, San Francisco, Kentucky, and India–are remarkable in their sympathetic and quietly sensual view of the world. They illuminate the rare, lyrical vision of a photographer whom, while living a highly reclusive personal life, was able to record the lives of others with remarkable sensitivity and poignancy. From the commerce of the street outside his Brooklyn apartment window to the daily chores of unemployed coal miners, from the indolent lifestyle of hippies in Haight-Ashbury to the sacred rituals of Hindu worshippers, Gedney’s unobtrusive view reveals the beauty and mystery of each individual life. Excerpts from Gedney’s correspondence and notebooks help us discover this intensely private man who captured the people and places around him with such striking clarity and intimacy. Geoff co-edited this book with Margaret Sartor, a photographer and research associate at the Center for Documentary Studies at Duke University.